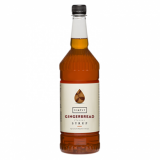 Monin Gingerbread (Pain d'Epices in French) syrup in stylish 70cl glass bottle. In North America, the word gingerbread is often associated with gingerbread cookies, the gingerbread house and, of course, the gingerbread man! All of these gingerbread items are associated with a feeling of warmth and cosiness during the winter holidays. Recreate that cosy feeling of warmth around the fireplace when flavouring your beverages with Monin Gingerbread! Monin Gingerbread presents a perfectly balanced blend of ginger and cinnamon for a true Gingerbread taste. Beyond the winter season, Monin Gingerbread can also be enjoyed year-round in milkshakes or iced and frozen coffees. Colour: Bright gold with amber glints. Taste: Complex nose of spices with strong notes of cinnamon; gingerbread cookies taste. Applications. Coffee, flavoured milks, dessert drinks, cocktails, cocoas. Sugar, water, flavouring, acidifying agent: citric acid, natural cinnamon flavouring, colouring agent: caramel E150a, preservative agent: E202.